TEHRAN, Iran (AP) — Hard-liners batter President Hassan Rouhani over his faltering nuclear deal, sending his popularity plummeting. Women in the streets film themselves removing their mandatory headscarves, or hijabs, in protest. Meanwhile, state television airs moments from a major corruption trial. Welcome to the topsy-turvy world of Iranian politics. Ahead of the 40th anniversary of Iran’s Islamic Revolution, the country’s government is allowing more criticism to bubble up to the surface. Analysts say that may serve as a relief valve in this nation of 80 million people, which already has seen widespread, leaderless protests rock the country at the start of the year. But limits still clearly exist in Iran’s Shiite theocracy, ensnaring lawyers, activists and others in lengthy prison terms handed down in closed-door trials. And the frustration people feel may not be satiated by complaining alone, especially as U.S. sanctions on Iran’s oil industry take effect in November. Perhaps the person in the biggest lurch in Iran now is Rouhani. America appears poised to further sanction Iran despite Tehran abiding by Rouhani’s nuclear deal with world powers, which saw Iran limit its enrichment of uranium in exchange for sanctions being lifted. In response, Rouhani has slowly replaced his message of rapprochement with the West with hard-line hints about Iran’s ability to close off the Strait of Hormuz, through which a third of all oil traded by sea passes. Part of that may be a hedge over his political future. The 69-year-old Rouhani, himself a Shiite cleric, could potentially be considered when Iran picks its third-ever supreme leader. It isn’t out of the realm of possibility: Iran’s current supreme leader, Ayatollah Ali Khamenei, served two four-year terms as president before becoming leader after the death of Ayatollah Ruhollah Khomeini, the Islamic Republic’s founder. “From (Rouhani’s) perspective, the most important thing is to come through the presidency in one piece and keep himself in the running for the ultimate job, the supreme leadership, which will be up for grabs the day the 79-year-old Khamenei dies,” recently wrote Alex Vatanka, an analyst at the Washington-based Middle East Institute. But popular anger continues to rise against Rouhani, threatening whatever mandate he could claim in the future. Telephone surveys by IranPoll, a Toronto-based firm, also have seen a precipitous drop in Rouhani’s popular support. After scoring a high of 89 percent popularity in August 2015 in the wake of the nuclear deal, Rouhani is now polling at an “all-time low” of around 20 percent, said Amir Farmanesh, the CEO of IranPoll. The margin of error for the firm’s polls was around 3 percentage points. “A president whose election slogan was the ‘Government of Prudence and Hope’ will be hard-pressed in the next three years of his term to bring back the promised hope,” Farmanesh told the AP. There are signs, however, that the Iranian government recognizes the growing anger. Iranian broadcasters, all state-run, have been airing major corruption trials in recent weeks. They’ve also allowed skeptical reporting by local newspapers on some cases, like mobile phone importers abusing their foreign currency privileges and another where an alleged “Sultan of Coins” somehow hoarded two tons of gold coins. At the same time, social media photos of children of the country’s elite enjoying luxuries the average Iranian can’t have similarly sparked outrage. Iran saw nationwide protests in late December and early January over its worsening economic situation, which resulted in nearly 5,000 reported arrests and at least 25 people being killed. 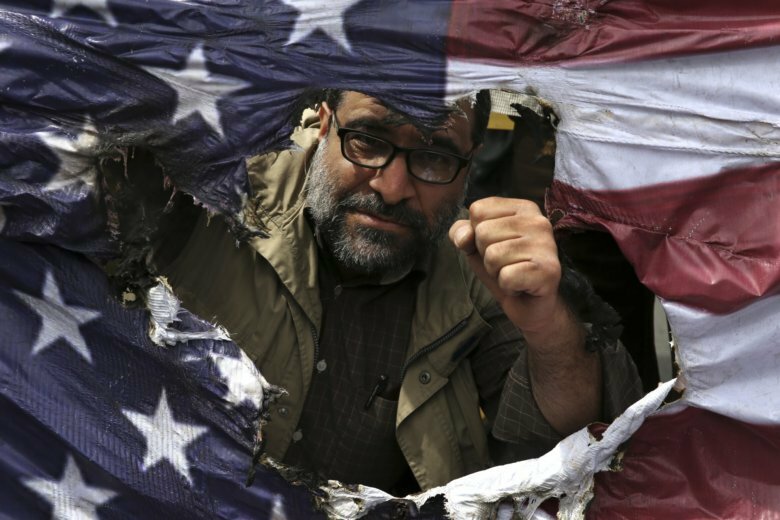 Iran’s economy only has gotten worse since President Donald Trump withdrew America from the nuclear deal, with the rial going from 62,000 to one U.S. dollar to as low as 150,000 rial to $1. Also, an attack by Arab separatists Saturday on a military parade in the country’s southwest killed at least 25 people. Meanwhile, social change can be seen on any street in Tehran, as some young women wear their state-mandated hijabs loosely over their hair. Some even shrug it down to their shoulders while driving. An image of a young woman, her head uncovered and waving her hijab like a flag in Tehran’s main Enghelab Street while standing on a telephone junction box, became famous during the economic protests. In the time since, authorities have welded slanted roofs over such junction boxes to stop women from carrying out similar protests. Tehran’s police meanwhile have said they won’t arrest women for not observing the Islamic dress code. However, online videos of women being harassed continue to circulate on social media. A public referendum on the hijab and other issues, such as whether Iran should re-establish relations with the U.S., could be one way to address the public’s concerns, said Hashemi, who learned politics from her father while growing up in a home only steps away from Khomeini’s own.